It finally happened. After months and months of speculation, the trade finally happened. Roberto Luongo and Steve Anthony have been traded to the Florida Panthers for young forward Shawn Matthias and goalie Jacob Markstrom. Vancouver will retain 15% of his salary until the end of his career. If he retires in 2021, the Canucks will be penalized 8.5 million dollars in the Cap Recapture rule in the new CBA. This trade for me came out of nowhere. Although reports were true about Luongo being in trade rumors, I didn’t think it was going to happen. The Canucks made it believable last season at the deadline when they couldn’t trade the goaltender and then traded Schneider away at the draft. 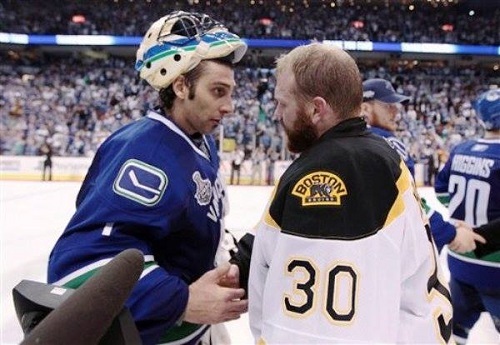 But after getting the snub from the Heritage Classic, that was the last straw I guess for Luongo. I don’t truly think this was the right time to trade away Luongo as they are trying to make a push for the playoffs, but I guess someone in the organization has hit the rebuild button early. This wasn’t a good trade for the Canucks either, but it was the best they probably could get right now for him and probably was orchestrated by his agent Pat Brisson who he met with in Phoenix earlier today. This will likely be the beginning of a few moves that will happen in the course of the next few months for the Canucks, so let the rebuild cycle begin. So the Canucks went from Cory Schneider and Roberto Luongo, easily one of the best goaltending duos in the NHL to Jacob Markstrom and Eddie Lack in less than a year. They literally had it all and now like Drake, they’re starting from the bottom.